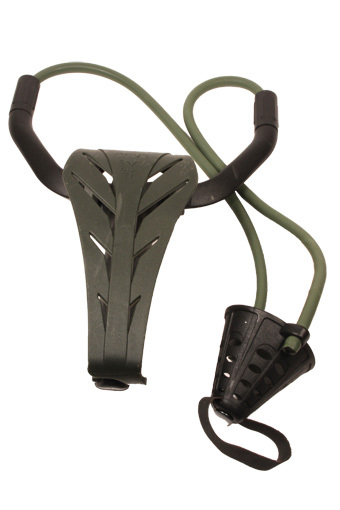 Moulded camo ’pult with no handle grip. Super strength latex is brutal and finger grip is released early due to this. 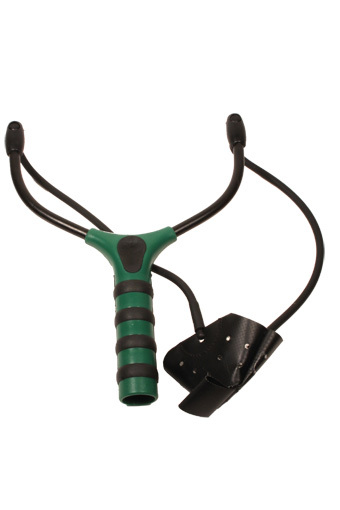 Swivel mechanism reduces latex twist and is connected to pouch and frame by standard, push-on spigot-style attachments. The pouch is extremely fragile and lacks any fold-over around eyelets. Accurate with singles but multiples need holding within pouch and fell short on distance. Unfortunately the pouch split after minimal use and needs to be redesigned. A compact, small handled ’pult with a sturdy frame. The ends of the arms are set at 90 degrees for securing latex, which is connected to the large flat pouch by push-on spigot-style attachments. The latex tends to twist around frame after use and also showed slight wear after testing. 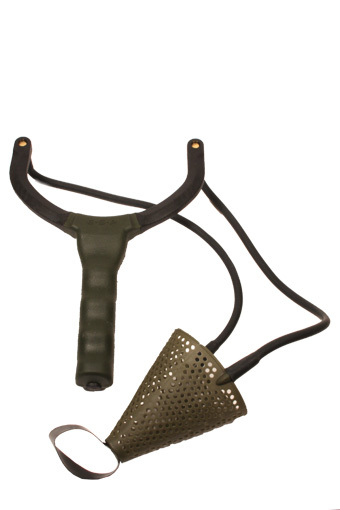 The pouch has reinforced eyelets and incorporates an easy-to-use finger pull. On testing it performed well on both single boilie accuracy and multiple grouping, but fell well short on distance. 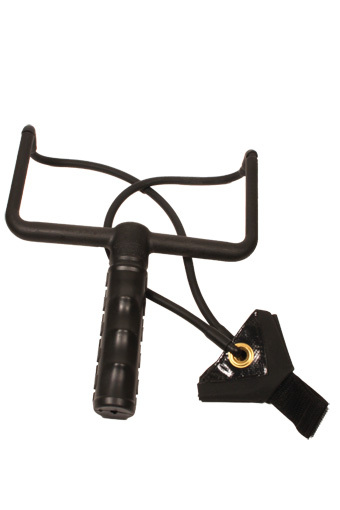 Hollow handle yet rigid frame with comfortable rubber thumb position and grip. Strong latex connected by cable ties to frame. Swivel mechanism reduces twist. Standard push-on spigot style pouch attachment. Medium flat pouch with an easy finger pull base. Accurate firing of single boilies, minimal knuckle rap but multiples need to be held within pouch, reducing distance as well as tight grouping. Boilies falling short on 60-yard distance test. Rigid framed ’pult with a comfortable grip. Long latex is connected to the pouch as well as the frame by the standard push-on spigot-style attachment. Swivel mechanism incorporated to reduce twist. Boasts a big cone-shaped plastic pouch and easy-to-use finger release at the base. Unfortunately the system caused some serious knuckle rap, which created unease in use and loss of consistency in both single boilie accuracy and grouping of multiples. However, it did easily outfire all the others tested on distance. The T-shaped frame removes any knuckle rap, which creates confidence in use. A hollow, soft-grip handle and ultra light but sturdy frame with latex holding points set at 90 degrees. The latex connects to the medium flat pouch by push-on spigots. The shallow pouch is folded, with reinforced eyelets and a Velcro finger pull. Good on accuracy and distance, but multiple baits need to be held within pouch, which reduces distance and tight grouping. Latex began to work off frame after tests. Well thought out and certainly made to last, this was also the only one to incorporate a power guard that completely eliminates any knuckle rap. A solid, comfortable rubber handle with screw-on tops that house the pin-and-ring elastic connectors. 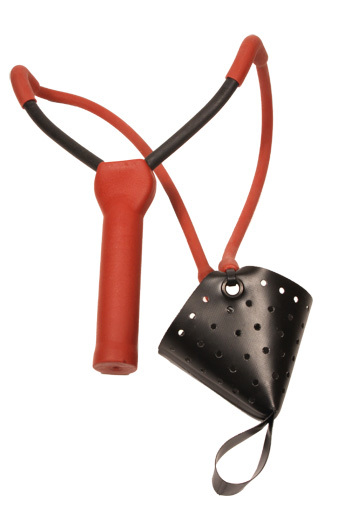 The latex is a couple of inches shorter than most, and connects through the moulded cone pouch, which has an easy to use finger grip at its base. It scored highly on single boilie accuracy and tight boilie grouping, but fell well short on the distance test. NOTE: All products tested April 2010. All prices correct at the time of going to Press. Angler’s Mail do not take responsibility for price or product changes or current availability.